And Minnesota is experiencing some awesomely WARM WEATHER. Those three things + these 20-minute ancho chicken tacos are a force to be reckoned with in my life right now. Let’s just get this out of the way right off the bat: these tacos are stupidly simple. Like, this is probably not the right recipe for everyone because they’re SO simple. If you’re embarrassed by easy recipes, we still love you but Goodbye. So long. See you next time. The rest of us who are the opposite of embarrassed by easy recipes get to stay and enjoy ourselves some extremely simple ancho chicken tacos that make for a perfect hurry-up-and-eat Monday night meal. Party in the kitchen! One thing I’ve learned about myself in the last few years of creating a food blog is that most of my favorite recipes are focused around sauces or toppings. These ancho chicken tacos are following that Toppings Rule, since the tender spiced chicken gets wrapped up a nice warm corn tortilla and then topped with, um, let me see here, EVERYTHANG —> there’s cilantro, cabbage, a squeeze of lime, plus jalapeños, sour cream, green onions, and avocados if you dare to be that seriously awesome. To which I say: bring it. Yesterday I went for my first spring run around the lake – “spring” meaning both warmer weather and more it’s-still-light-out hours in the day. There were dogs and babies and friendly people in light jackets everywhere, and it was magically happy. SPRING! When it comes to outdoor running this winter, I have sort of been, like, not doing it. Hibernation was the name of the game this year – I most definitely did buy running leggings and a cute neon pink sweatshirt right around January 1st (I AM A CLICHE) to encourage myself to get outside and run, but the reality is that there is no competition when it comes to Minnesota in January and February vs. the big, squishy gray couch and the fluffy white blanket. None whatsoever. But good thing I bought the cute running outfit. Like an athletic spring champion, yesterday I actually put on said cute running outfit for, like, the third time since buying it, and I took on the happy lake run in our hood like a person who had not been outdoors for a lifetime. Speaking of had not been outdoors, I am not even kidding when I say that sometime in February I had the horrible experience of waking up and realizing that, in fact, I had not left the confines of the house for 4 (one two three four) full days. You know, working from home slash Minnesota winter slash I TRAPPED MYSELF IN MY OWN HOUSE. Get yourself ready, because these ancho chicken tacos with all the fresh toppings want to say hi to your face! I’m 100% positive that you can find 20 minutes to make these during the Bachelor finale commercial breaks tonight. You and I both, my friends. You and I both. Cheers to simple, fresh, perfect Monday chicken tacos! 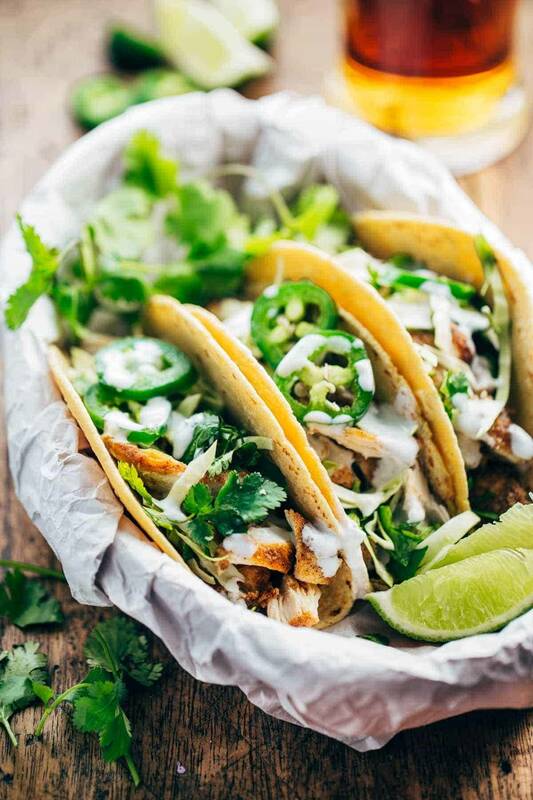 20-Minute Ancho Chicken Tacos that are ready super fast and go perfectly with cilantro, jalapeño, sour cream, and lime juice! Toss the cabbage and cilantro together. Prep the other toppings. Combine the flour, ancho chili powder, southwestern seasoning, and salt and pepper in a shallow dish. In a heavy duty pan, heat the oil to medium high heat. Cut the chicken breasts in half or quarters, toss in the flour mixture, and add to the pan. Cook for a few minutes; flip, and cook for another few minutes until the outside is browned and the inside is no longer pink. Remove from heat, sprinkle with a little more salt, and allow to rest for a few minutes. Cut or shred the chicken into small pieces. Warm tortillas (I just microwave for a 20 seconds or so) and assemble with the chicken and toppings. Be generous with the lime juice and jalapeños for extra zing! When I heated up the leftover chicken, I tossed the chicken pieces in a pan with a little water and let it simmer a little while – it was phenomenal! It made the chicken a little bit saucy, which we loved. As written, these tacos are relatively mild. The toppings are what really gives it a kick, so you can pump up the flavor by adding some spicy salsa, jalapeños, or diced red onions, either raw or sauteed with the chicken. You totally speak my language! Toppings it totally the only reason I adore chili and tacos. I LOOOOOVE being able to make each bite the way I want. Its awesome. And simple recipes are my jammmm….fancier recipes are for the weekend. This looks like a perfect lazy weeknight meal! Nope, no embarrassment here over easy. As an up-and-coming cook (ahem, insert long pause here), I need all the help I can get. Maybe even a tutor. Some food blogs do post awesome recipes, but I can’t do them so I email them to my mom in the hopes she might cook for me (not likely, I’m too old for that now that I have mouths to feed on my own). And if there’s one thing I’ve learned in life…….You cannot eat at Chipotle every single night. Eventually, you will tire of it, so learn to make your own Mexican. Welcome home you two! It’s great having you back. my philosophy is the cuter the running outfit the fastest you go! =)… and this recipe sounds + looks amazing. PINNED! hahaha! I love that philosophy. I agree – the secret is in the sauce. Sauces make everything special! These look super delish! What is it about tacos and warm weather? I made them a couple of weeks ago on the first day that was over 30 degrees here in New England for a “pretend it’s summer” day (with margaritas, of course) 🙂 These look amazingly simple and awesome! I usually mix together equal parts cilantro and red onion with a little lime juice for a quick taco topping and literally douse it in chipotle hot sauce. Yum yum yum. Pinned! These tacos sound great. And I’m glad you had a good vacation. Yeeessss. Everything about these – toppings, spices, PHOTOS. Obsessed. I wonder how they’d be with tofu? And girl, I feel ya on spring! It’s 28F right now and I’m not even cold when I went to my car. Score. It makes me feel better about my not leaving the house at all this weekend reading about your winter hibernation 🙂 confession: I just bought a new running jacket (on sale!) and it’s made me feel so cute when I do get out for a run. Oh yes…I’ve been longing for salsa and tacos all day! These look delicious, yet simple and perfect for a weeknight! I think I just figured out what’s for dinner tonight. Just in time for #tacotueday – totally making these. It will reassure me that summer nights on on their way! The more toppings, the better!!! These look absolutely perfect for tomorrow’s Taco Tuesday night! Yeah for warm MN weather & Yeah for your chicken tacos – YUM! Wow these sound delicious Lindsay and something we all would love at my house!! And 20 minutes to make them is perfect! Yay for extra hours of sunshine and for whopping 40 degrees! I too was trapped indoors here in Chicago for close to a week without leaving the house. This is a nice change! I love a good taco recipe! I was just talking with my friends this weekend about how you cannot make a bad taco! Loving the color and spice on that chicken! Agreed – tacos are delicious by nature. Thanks for the comment Stefanie! Love this taco recipe! Now And I love how quick it comes together – great for busy nights! I have been craving Mexican food lately, this will definitely need to enter my meal rotation for the week! So glad I’m not the only who buys winter exercise clothes for my New Year’s Resolutions and then refuses to exercise outside! Woo! Four days inside… it is a sign of how brutal this winter has been that I am actually JEALOUS that you got to spend four straight days in your cozy home. That might be on my bucket list… by might be I mean definitely, most certainly is. With a tofu sub for chicken, these MUST GET IN MY BELLY ASAP AS POSSIBLE. (Please tell me you got that M.Scott reference). hahahahaaaaa. Your references to M. Scott just make my life so happy. Love, love, love tacos! Anything with fresh lime and cilantro just adds to the dish. Plus, it reminds me of warm, sunny days! Hope we’ll get to hear about your time in Charleston!! Mmm this sounds so good. I think my husband would be thrilled if we had tacos every night. I bought cute leggings in January too, I needed all the inspiration I could buy to get off the couch. I’m not even in Minnesota but this year Maryland has been cold enough! Mmmm I would love to make these with tofu. Looks delicious! Those look delicious! I love making my own tacos.